Averil Robinson was devastated by the loss of her beloved Siamese cat. There were no services available at that time to help her deal with the situation. The insensitivity of those that did exist only added to the heartbreak. She had come from a family of dog breeders where pets were given a high priority and she had been taught from childhood that pets were equal to humans. The animal disposal situation in Montreal bothered her so much that she felt she had to do something about it. In 1998, she opened “Pet Friends” a funeral home and cremation facility for pets. Her background in taking care of pets, and her own experience of the loss of her cat taught her how to help her clients deal with the death of their beloved furry friends. Pet Friends’ Funeral Home has been modeled on a human funeral facility. Each pet is individually cremated, numbered and certified. Everything is handled with security, great dignity and respect. The process begins upon being advised of the passing of the pet. The same day, a member of Pet Friends’ staff goes to pick up the pet from either the client’s home or veterinarian clinic. The pet is wrapped carefully in a blanket and transferred to the funeral home. Once the pet is at the funeral home, the family has the option of a viewing or attending the cremation. Urns for the ashes may be selected from a range of qualities and prices to meet the family’s budget. A beautiful lake property is available to scattered the ashes for those who do not wish to keep them. Whatever the need Averil Robinson and her professional staff are there to help the clients deal with their bereavement. The staff can handle any situation with understanding and sympathy. The service of a grief counselor is available for those who require it. Also offered are the religious services of an inter-denominational minister who conducts a ceremony for the bereaved family before the cremation process. “We follow the religious protocol of the guardian family. We understand the pain our clients are experiencing and we are here to help them ” explains Averil. Averil Robinson and her professional team handle difficult situations with great empathy and grace. Chantal and Gail are at the reception desk, Fernand and Yves are the cremation technicians and Kevin handles the transportation of the pets from the home or the veterinarian to Pet Friends. 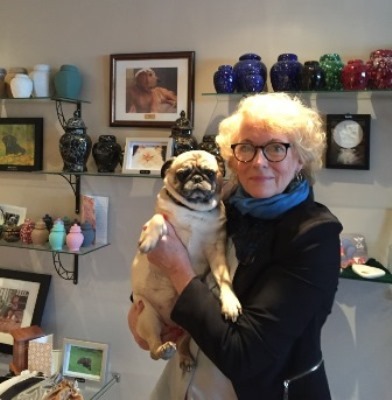 A recent addition to the staff at Pet Friends is a small rescue pug dog named Peggy Sue whose funny face and friendly manner provide comfort to the mourners.